Last Sunday we met up with a friend from Norwich, Nina. 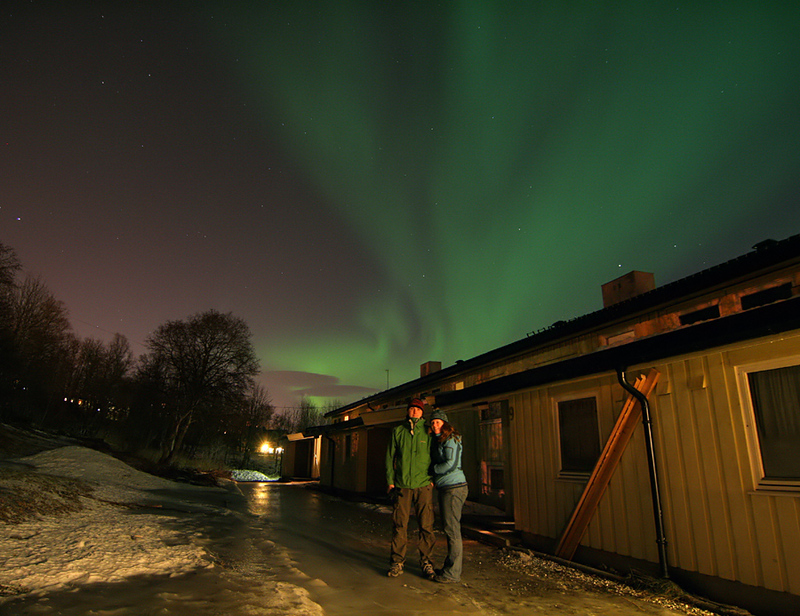 She’s a PhD student in the same project that I was in, and she was in town for the Arctic Frontiers conference. 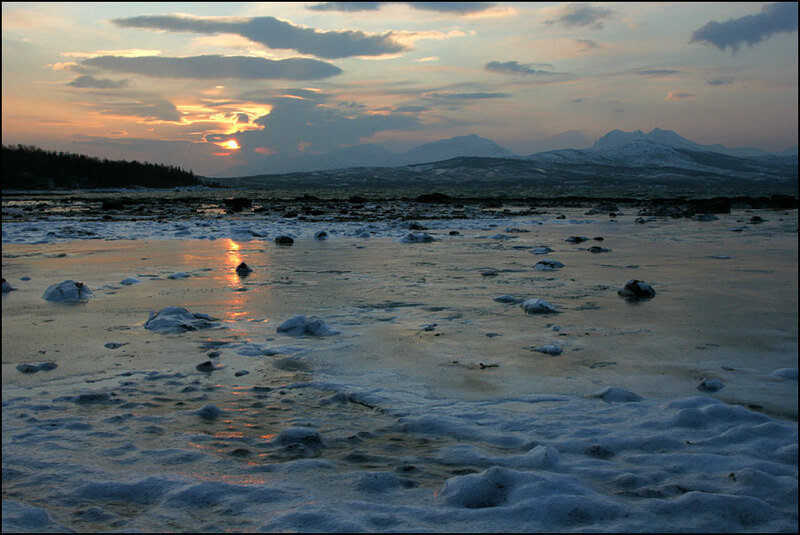 We picked up her and Svetlana (Nina’s friend from Russia) from their hotel in town, and we drove to Håkøya – the same place I took the sunset photos in the last post. 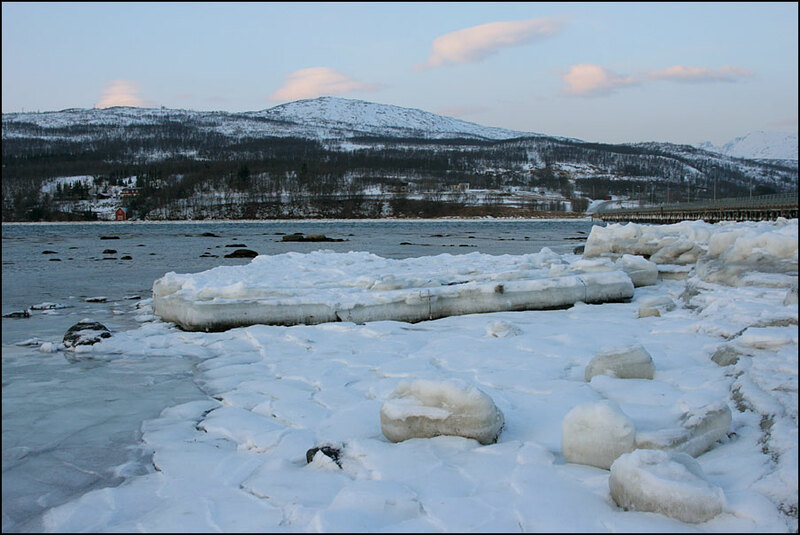 We had a VERY cold spell in Tromsø last weekend. 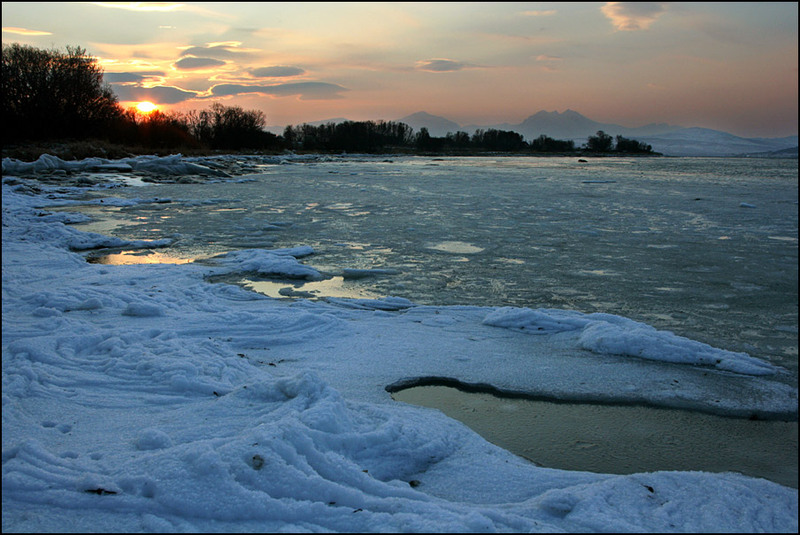 The lowest temperature measured was -15, for the first time since 1998! 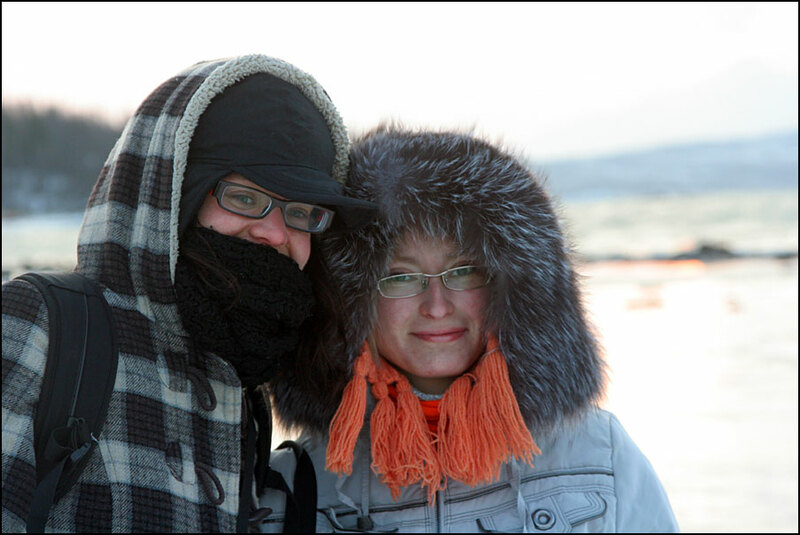 Combined with a strong wind, it was seriously freezing. We went for a short walk on the beach. 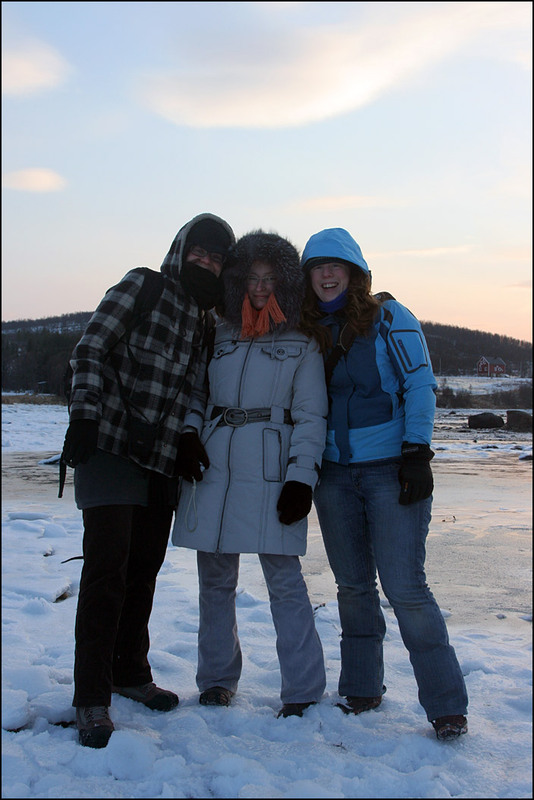 Here’s a photo of Nina (on the left), Svetlana (middle) and me, and one of Nina and Svetlana. 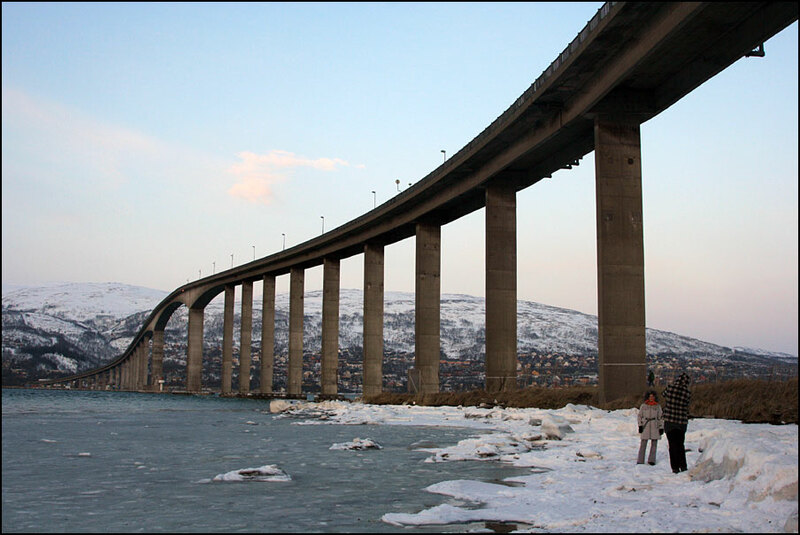 We drove back to town and stopped underneath the bridge between Tromsø island and the island of Kvaløya. Svetlana wanted to take some pictures of the bridge. I had never stopped there, but it was really impressive to stand underneath the bridge! 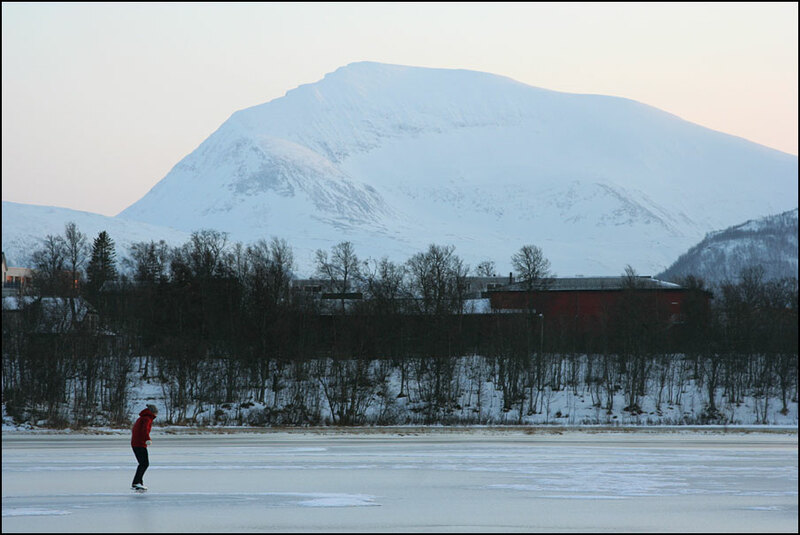 Our next stop was Prestvannet, the lake on top of Tromsø island. 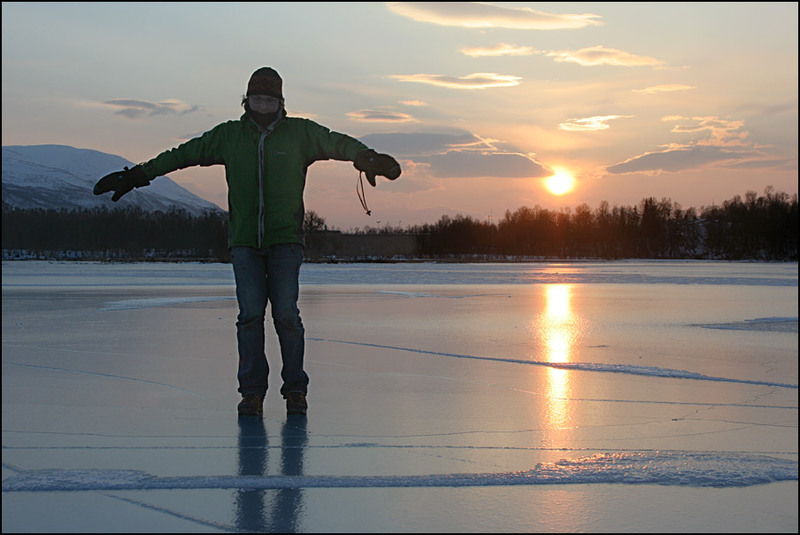 We’ve hardly had any snow this winter, which means that you can skate on the lake! There were quite a few people braving the cold wind. I was hoping to go skating too, but as we’re in the middle of moving my skates were somewhere in a box and I couldn’t find them. 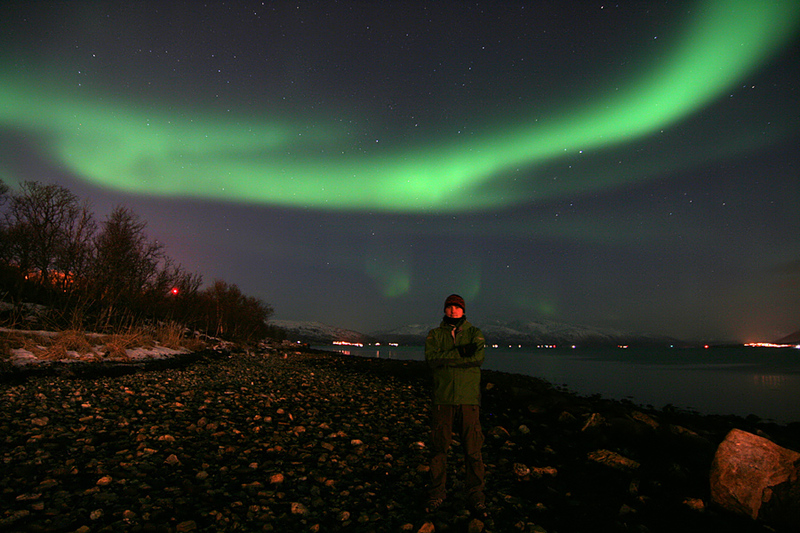 The aurora was so good that we decided to drive to a beach near the north tip of the island. 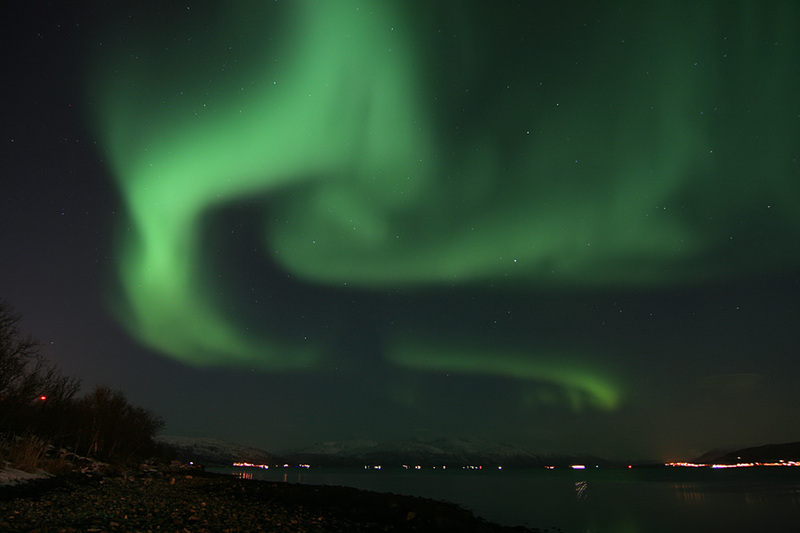 When we arrived there, it started to move like crazy, dancing across the sky. 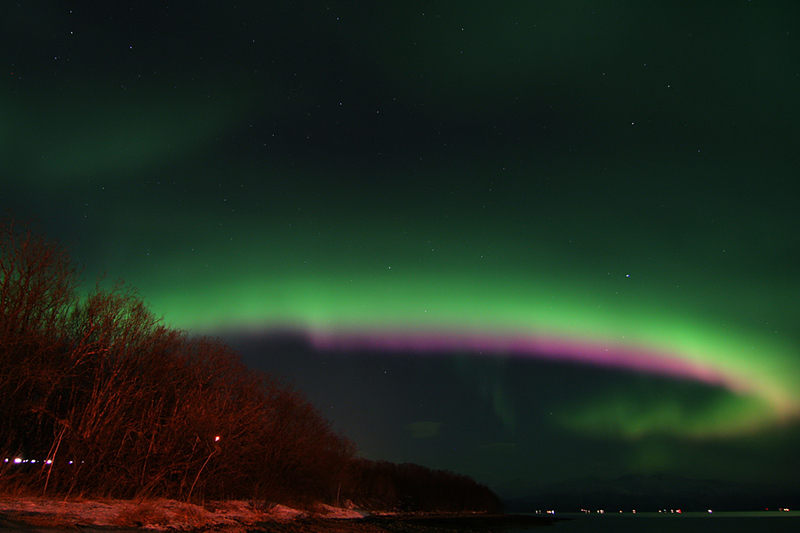 It was showing some pink as well, as you can see below – very impressive! 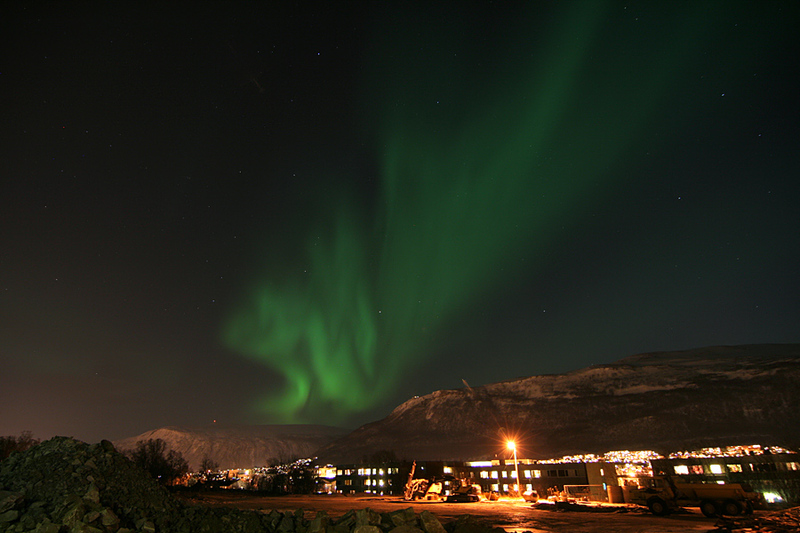 And those aurora pictures are too beautiful for words! I don't know when I'll be on the radio but it will be sometime soon. They asked me last week if I wanted to do it, but I need some help with pronunciation first 😀 It should be ok though, it's really just reading the forecast from paper. I'm struggling more with the phone calls at work, I hope that will get better soon. De zonnevlekken zijn blijkbaar toch weer wakker. Mooie plaatjes. Dankjulliewel! 🙂 De zon is heel actief de laatste tijd, geloof dat we eindelijk uit het minimum klimmen!